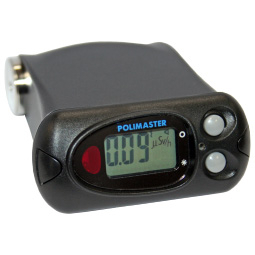 PM1703MO-1 (PM1703®) combines features of both Personal Radiation Detector and Dosimeter. Instrument is equipped with two detection modules: highly sensitive CsI(Tl) scintillation detector and small-sized GM tube detector. CsI(Tl) scintillation detector allows to search radioactive and nuclear materials and GM tube detector allows to measure dose rate of gamma radiation in the wide energy range. Instrument has non-volatile memory, audible, visual and vibration alarms, shockproof hermetic case, compact size and light weight, user-friendly interface and doesn`t require special knowledge or training of personnel. Due to compact form, user can wear PRD on the utility belt. PM1703MO-1BT (PM1703®) - is equipped with Bluetooth v 4.0 Low Energy Module (BLE112) and can exchange data with user’s mobile device in real time. PM1703MO-1/PM1703MO-1BT (PM1703®) are recommended for customs and border guards, personnel of nuclear power plants, isotope laboratories, first responders, firefighters, military, police, etc. Instruments of PM1703MO series (PM1703®) combine functionality of both Personal Radiation Detector and Dosimeter. Instruments measure ambient dose equivalent rate and ambient dose equivalent of gamma and X-ray radiation, search radioactive materials and alert user with audible, visual and vibration alarms. All operation history is stored in the instruments non-volatile memory, protecting the data even when the battery is removed. The stored data can be transferred to a personal computer via infrared interface or Bluetooth (PM1703MO-1BT (PM1703®) modification). Instruments can be equipped with the additional registration modes of specific activity and surface activity of the 134Cs, 137Cs radionuclides in different samples, such as food, drinking water, different liquids, crumbling construction materials, soil, etc. by special order. PM1703MO-1BT (PM1703®) is able to transfer data via Bluetooth® 4.0 to smartphones with "Polismart® II" Mobile App. Free Mobile App is available for iPod® touch, iPhone®, iPad®(iOS) and for AndroidTM mobile devices and can be downloaded from App StoreSM or from Google PlayTM. * iPhone, iPad touch, and the App Store logo are registered trademarks of Apple, Inc. Android and the Google play logos are trademarks of Google, Inc.